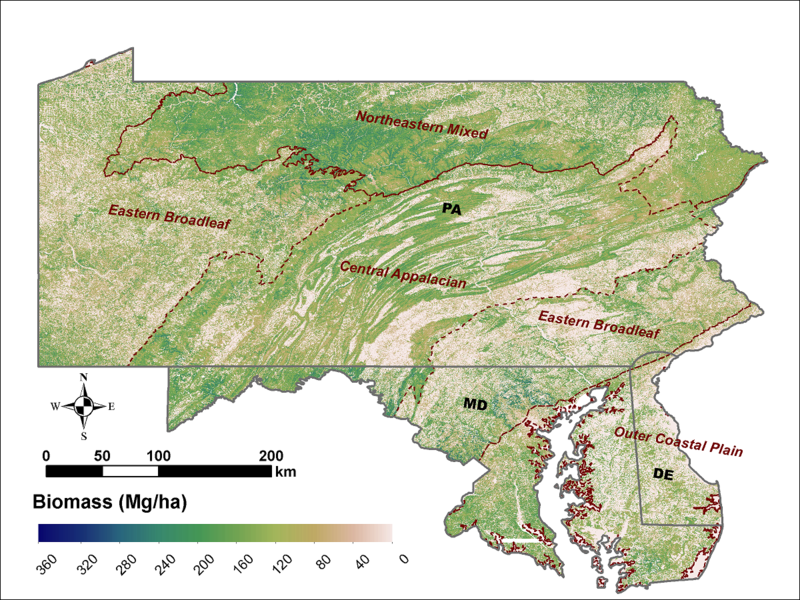 A new dataset from the NASA Carbon Monitoring System (CMS) provides 30-meter gridded estimates of aboveground biomass (AGB), canopy height, and canopy coverage for the Maryland, Pennsylvania, and Delaware in 2011. Leaf-off LiDAR data were combined with high-resolution leaf-on agricultural imagery in a model-based stratification that was used to select 848 sampling sites for AGB estimation. Field-based estimates were then related to LiDAR height and volume metrics through random forest regression models across three physiographic regions. CMS is designed to make significant contributions in characterizing, quantifying, understanding, and predicting the evolution of global carbon sources and sinks through improved monitoring of carbon stocks and fluxes. See all data from the Carbon Monitoring System project.